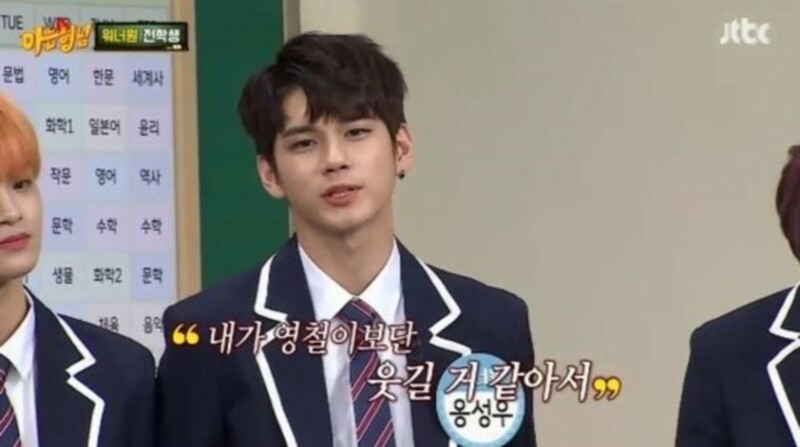 Wanna One's Ong Seong Wu�expressed he's funnier than Kim Young Chul on the April 7 installment of 'Knowing Brothers'. The Wanna One members greeted the 'Knowing Brothers' cast, and Kang Ho Dong�remembered�Park Ji Hoon�from 'Give Me a Meal', saying, "You looked like a child before, but now you look like a manly man." Hwang Min Hyun�also mentioned, "I want to visit Seo Jang Hoon's house." However, Ong Seong Wu suddenly turned the tide by suddenly saying, "I think I'm funnier than Kim Young Chul. I've come to take his spot." How do you think Ong Seong Wu would do on 'Knowing Brothers'?